: The Soil and Terrain database for Tunisia primary data (version 1.0), at scale 1:1 million (SOTER_Tunisia), was compiled of enhanced soil information within the framework of the FAO's program of Land Degradation Assessment in Drylands (LADA). 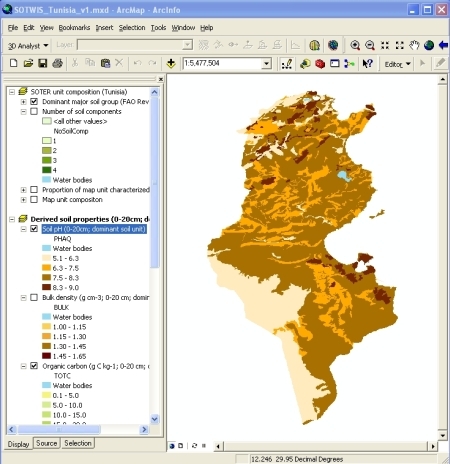 A SOTER database was compiled based on the digital soil map of Tunisia. The primary soil and terrain data for Tunisia has been selected from available survey reports and publications. A SRTM-DEM was used to adjust some unit boundaries in the GIS file. be18fb28-4f85-41d0-a448-6d56fba8bd3b Access to the portal Read here the full details and access to the data.